I can hardly believe that it’s already time for the third in the Squishy McFluff series – Squishy McFluff: Meets Mad Nana Dot – to land on bookshop shelves! 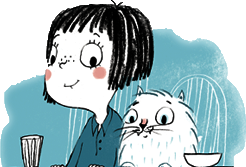 I’m very excited because this story is perhaps my favourite. It’s the one in which Ava’s little sister, Baby Roo, is born. While Mum is busy giving birth, Ava and Squishy get to have a day and a night with Ava’s rather eccentric Nana Dot, who has lost her glasses and yet appears to be able to ‘see’ Squishy McFluff! 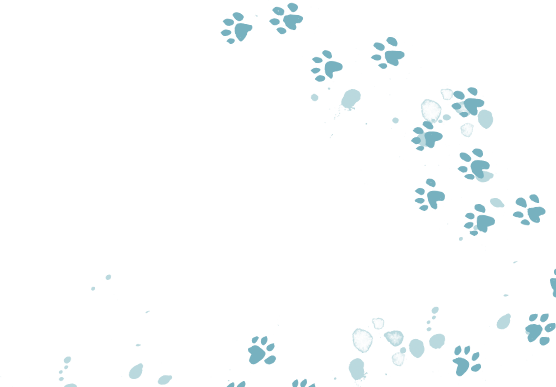 There are two questions I am often asked about writing the Squishy McFluff stories. One is, how do you go about writing them? The other is, where do you get your ideas from? In answer to the first question, I usually plot out the story in a non-rhyming text, and then begin writing the rhyme – as you might expect – at the beginning. 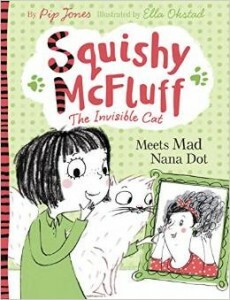 But Squishy McFluff: Meets Mad Nana Dot was unique in that I didn’t start at the beginning, I started at the end. Hence, the very first lines I wrote were the final four lines of the book. “Just giggling and guzzling and gurgly squawking. The real Ruby was VERY excited to see ‘herself’ in a Squishy McFluff book for the first time. I’ll be honest, it’s only recently I’ve been able to read those four lines without welling up. I’m glad I’ve finally got a grip though, because it would be terribly embarrassing if I cried every time I read the final chapter in public! Anyway, the real Ruby was very excited to finally see ‘herself’ in a Squishy McFluff book. 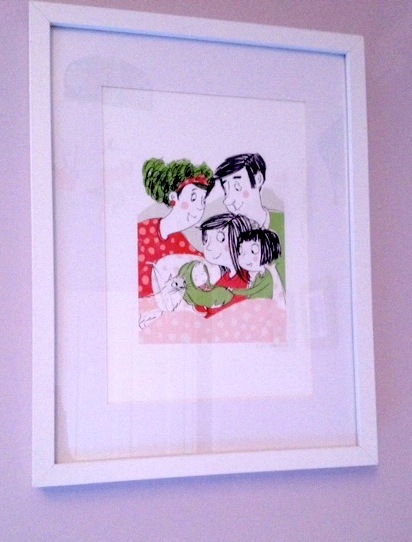 As an extra special treat, Ella Okstad, who I met in November, printed and signed the illustration in which Baby Roo appears for the first time – and it’s hanging, in all its glory, on the girls’ bedroom wall. As for the rest of the story, the ideas were inspired by real people and events, much like the first two Squishy books. Well, when I say ‘people’, I mean my own mum (known as Nana to Ava and Ruby). And when I say ‘events’, I mean one specific thing she did which made me laugh so much, I thought I absolutely must feature it in a story somehow. My children love going to their Nana’s house. We always arrive to find one end of Mum’s large living room filled with toys and activities for them. One weekend, we arrived for a visit and I went straight to the bathroom (as one tends to need to do, after a long journey) to find it looked somewhat different to the last time we had been. Previously, the bathroom had been decorated in grown-up shades of faun, with white tiles and shower curtain, black towels and mats. Now it was, erm, spotty. And I mean everything was spotty. The shower curtain, the mats, the towels, the flannels. All covered in large, multi-coloured spots. Imagine Damien Hirst’s spots, but the colours more vibrant. It looked MAD. Ha! She was right. They did like it. So her bathroom remains, to this day, crazily spotty and dotty – and that was how the character of Nana Dot came to be. 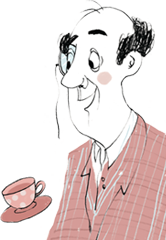 But inside – oh crumpets! Squishy’s eyes tied in knots! Each wall, rug and curtain was covered in spots! The kettle, the toaster, each pattern the same. It was obvious how Nana got her nickname! Incidentally, my mum, just like Nana Dot, is terrible with house plants and there was one year when she really did put up her Christmas tree in October. So far, however, she’s never had green hair. I really hope you enjoy the book, do let me know what you think in the comments. Thank you soooo much for the day!! You ladies were wernodful and we had such a great time! Cannot wait to see more and can already pick a couple we’ll be wanting blow-ups of! !